With nearly 100 miles of real-world electric range, the 2016 Kia Soul EV is an electric car for the modern driver. You get all there is to love about the gas-powered Soul, like a spacious interior, high-tech features, and more, but in an eco-friendly form. Currently, the Kia Soul EV is only sold in select markets, but we hope to see it expand nationwide soon. Luckily, you can find the Kia Soul EV in Gainesville, GA at Carriage Kia, so stop in for a test drive today! The 2016 Kia Soul EV operates on an efficient 360-volt permanent magnet AC synchronous electric motor. This all-electric vehicle can achieve up to 120 mpg city and 92 mpg highway**. You may be surprised, but the 2016 Soul EV can generate up to 109 horsepower and 210 lb-ft of torque. If you think it’s time for you to go green in an all-new EV, you have to check out the power and efficiency when you test drive a 2016 Kia Soul EV! 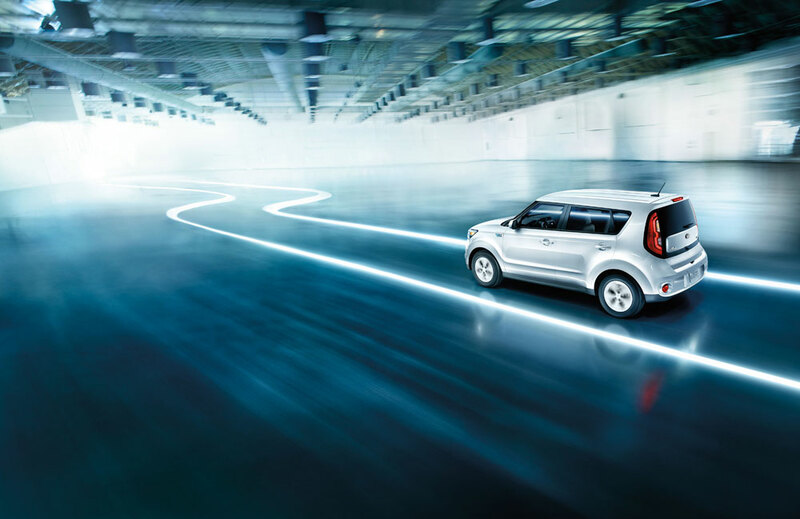 Everyone who has gotten the chance to test drive a Kia Soul EV, loves it for its fuel efficient all-electric motor and even more so for it’s iconic, stylish exterior design. The 2016 Soul EV has fantastic standard exterior features including: LED rear combination lamps, Privacy glass, Jewel type LED positioning lights, Variable intermittent windshield wipers, Body-color front grille charge port door, Auto light control, Solar control glass, Heated rear glass with timer, Dual body-color and heated power mirrors, Projector beam headlights, Body-color bumpers with contrasting color accents, and a Rear wiper/washer. 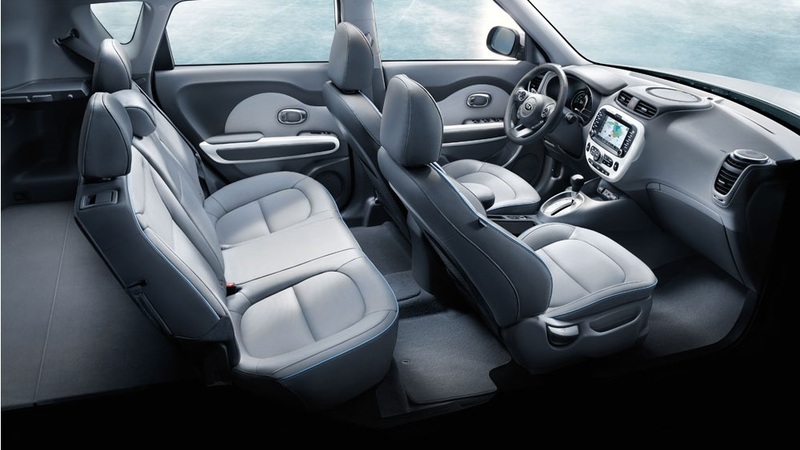 While everyone loves the look of the Kia Soul, you will especially love all of the fantastic interior features to keep you informed and connected! The 2016 Kia Soul EV comes standard with interior features including: Rear-seat adjustable headrests, Center console with armrest, Air induction control with Auto Defog System, Interior lighting with delay off, Bio fabric seat trim, Glove box with illumination, Leather-wrapped steering wheel, Front and rear door bottle holders, Day/night interior rearview mirror, Power windows with driver one-touch auto-up/down and anti-pinch, Satin chrome interior door handles, Heated front seats, Electronic Parking Brake with auto hold, 60/40 split-folding rear seat, Steering-wheel-mounted audio and cruise control buttons, Dual illuminated visor vanity mirrors, Tilt and telescoping column, Automatic climate control with cluster ionizer, Luggage under-floor tray, Bio-material interior trim, Soft-touch dash and upper door panels, Individual climate control, 6-way adjustable driver’s seat, Height-adjustable front seatbelt anchors, Dual front cup holders, and a Heated steering wheel. The standard radio and technology features are pretty impressive on a standard Kia Soul EV, including: Push-button start with Smart Key and immobilizer, Active Eco system, Supervision Meter Cluster with 3.5-inch Organic Light Emitting Diode color display, 6 speakers with dash-mounted tweeters, Illuminated USB/auxiliary input jacks, Trip computer, AM/FM/CD/MP3/SiriusXM audio system, Bluetooth® wireless technology hands-free connectivity with steering-wheel-mounted controls, and FlexSteer™. On higher trim levels you can find even more impressive interior features such as: Heat pump heating and air conditioning system, Climate scheduling, Leatherette door center trim inserts, Cargo cover, Leatherette meter hood, Ventilated front seats, Auto-dimming rearview mirror, Leatherette door armrest, Heated rear seats, and/or Leather seat trim. On these higher trim levels, the radio and tech features get better too! Enjoy some of the following features: UVO EV Services, Rear-camera display, Voice-command navigation with 8-inch display and HD Radio, and/or Parking Assist with front and rear sensors. Some of the standard safety features on the 2016 Kia Soul EV include: Electronic Stability Control, Vehicle Stability Management, Brake Assist System, Hill Start Assist Control, Dual front seat-mounted side airbags, Full-length side curtain airbags, Rollover sensor, Side-impact door beams, Front and rear crumple zones, Front seatbelt pretensioners, 4-wheel disc brakes with Antilock Braking System, Pedestrian Warning System, Tire-Pressure Monitoring System, LATCH, and Rear child-safety door locks. A spacious interior, high-tech features, great styling, and a fantastic electric driving range is just a small portion of all that the 2016 Kia Soul EV has to offer. Come take it out for a test drive today at Carriage Kia and experience something new in a 2016 Kia Soul EV today! With our large inventory, our team here at Carriage Kia loves helping our customers find the perfect new car or used car for them! Please feel free to contact us if you have any questions or would like to schedule a test drive! *2016 Soul EV starting MSRP is for the EV-e trim which will be a limited production model sold initially only in CA. **Based on EPA estimates. Actual range and mileage will vary with options, driving conditions, driving habits, and your vehicle’s condition.